Enjoy our awesome range of Earth facts for kids. Check out the cool trivia and have fun learning about some of our planet's most amazing features. Learn more about the Amazon rainforest with our range of fun facts for kids. Find out where the Amazon rain forest is located, how big it is, what kind of plants and animals live there and much more. The Amazon rainforest is the largest tropical rainforest in the world, covering over five and a half a million square kilometres (1.4 billion acres). Over half of the Amazon rainforest is located in Brazil but it is also located in other South American countries including Peru, Venezuela, Ecuador, Colombia, Guyana, Bolivia, Suriname and French Guiana. 10% of the world’s known species live in the Amazon rainforest. 20% of the world’s bird species live in the Amazon rainforest. It is home to around 2 and a half million different insect species as well as over 40000 plant species. There are also a number of dangerous species living in the Amazon rainforest such as the cougar, jaguar and anaconda. While the protection of the Amazon rainforest remains an issue, deforestation rates have been reducing while areas of conserved land have been increasing over the last 10 years. In both 2005 and 2010 the Amazon rainforest suffered severe droughts that killed off large amounts of vegetation in the worst affected areas. A recent study by climate change experts suggests that a 3 °C rise in world temperatures by the year 2010 would destroy around 75% of the Amazon. 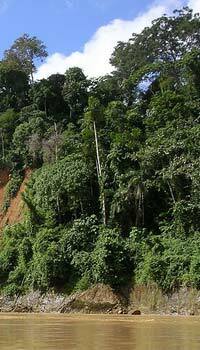 Enjoy more rainforest facts or if you want to learn more about the Amazon check out our Amazon river facts.